Synonyms: I Started Being a Teacher for a Youkai School! A crybaby and timid novice teacher, Abe Haruaki has been appointed to teach—as much to his surprise—in a school full of youkai?! 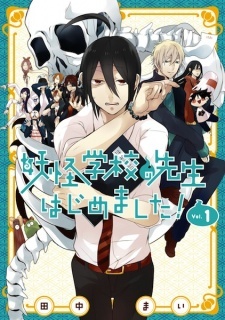 A story which portrays the weird and wonderful daily lives of a coward human teacher and his youkai students. Youkai Gakkou no Sensei Hajimemashita! has been published in English as A Terrified Teacher at Ghoul School by Yen Press since December 19, 2017. This series has absolutely hit it off with me and I may be kinda picky with what I like but I still have a range that goes over all genres. I do really like comedy and this type of manga/anime where like in A terrified teacher at ghoul school, there can and probably will be serious moments but isn’t like 90% of the time. Gintama would be a good example of that maybe. I also really can’t pick a favorite character! Each are just so good and well done. (I’m also kinda picky with characters to!) to me this is all saying a lot about this series. A Terrified Teacher At Ghoul School is a very very good and so underrated series. The characters, art, plot are so well done I think and fit in so well with each other. The manga is very well done and very very enjoyable. I get so joyed reading it (Which I just did reading volume 2!). The series itself is in a way unique, there has been youkai stories and all but none really like this one. I hope everyone will at least try out this series! It’s really good! I think anyone who would like gintama, or just comedy in general, would really like this series. Every character and their design, the art in general, and how well the story really goes well together and makes you feel like you’re reading a short but very very fun enjoyable read is just incredible. This manga is worth a try! And at two volumes at this moment in English you could totally catch up to it! Please check it out and support it! !